Start saving now: your next phone is almost here! 2015 was a bonanza year for smartphones, but there's plenty more to come over the next 12 months: handsets are getting more powerful, designs are getting more innovative, and if you're in the market for a new mobile next year you're going to be spoilt for choice. To give you an idea of what's coming over the hill in smartphone terms, we've rounded up everything we know and everything we think we know about the greatest handsets of 2016: a lot of manufacturers like to play their cards close to their chests, however, so not all of this information is set in stone just yet. The world's most recognisable and well-known smartphone is a good a place to start as any, and Apple is almost definitely going to release another iPhone in September, as it does every year. After the 'S' updates of 2015 we should see the number tick up to 7, and it's likely that the company will stick with the pattern of releasing a smaller (4.7-inch) and larger (5.5-inch) model for consumers to choose from. Apple isn't leaking much about the upcoming handsets but the rumours are the new phones could be more rugged and waterproof than the existing ones. The screen resolution is due for an upgrade this year, while insider sources suggest Apple wants to ditch the headphone socket in favour of the Lightning port. We should get some more hints when iOS 10 is announced at WWDC in the summer. Sony had a patchy 2015 as far as smartphone launches go, but the Xperia Z6 might well be enough to help the company's smartphone division get back on track.... possibly. While it might not set the world on fire in terms of sales numbers, Sony's Xperia range represents some of the best-looking and most powerful handsets on the market. But MWC threw the possibility of seeing a Z6 into doubt, with company officials saying the new X range would replace the Z models (then others saying the Z range wasn't going anywhere). Who knows what's happening... clearly not Sony. So what can we expect in 2016? The early hints are that there are going to be no fewer than five different variations of the Xperia Z6, and the handsets are set to offer Sony's version of the 3D Touch technology currently available in the newest iPhones. The traditional Xperia look should be in evidence again, while the usual dust and waterproofing are likely to be in place too. The indications are that Sony's taking its time with its next flagship, so expect something significant in the next year. Of course, the X range MAY appeal to potential Z buyers. They're well specced with a 23MP rear camera and HD screen, but they're clearly not flagships though. MWC was a good start of the year for smartphone releases, and we're already spotting some of the new handsets on the streets. 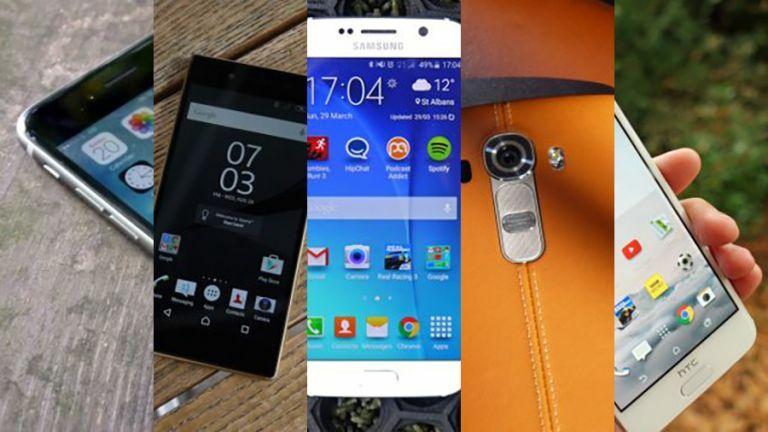 These are the previously-eagerly-anticipated smartphones you can get right now! The HTC 10 was announced on April 12. It was a pretty impressive launch, and showed the HTC has tried to improve a number of areas they were previously weak. HTC 10 is an evolution of the M7/8/9 design, there are chamfered edges and a soft curved back. The HTC One M9 had a lot to commend it, but it failed to capture the imagination of the public, and the manufacturer is going to want to make sure that its 2016 flagship ticks all the right boxes. The HTC 10 looks like a pretty good smartphone, with flagship specs, an improved camera 12 Ultrapixel camera, (claimed) two-day battery life and great, near-stock Android software. Quick charging is thrown into the mix, there is also high-res audio and Boomsound is back. HTC is making a real statement with this smartphone, it's one of the best out there, and shouldn't be ruled out based on their past failures. All eyes were on Apple's biggest challenger at MWC 2016 - Samsung had a respectable level of success with its 2015 line-up, including those innovative Edge models, and it capitalised on that momentum with the slightly improved S7 and S7 Edge. The phones take last year's winning design, and added waterproofing and expandable storage - two features sorely missed from the previous generation. While the design changes from the Galaxy S6 and Galaxy S6 Edge are minimal, the internal specs received the usual bump. There's a large 3000 mAh battery and improved low light camera. Impressed? You can pre-order the phone now, with deliveries expected around March 11. Samsung Galaxy S6 vs S7: what's changed? We were rather impressed with the LG G4 that launched in 2015, so LG had some high standards when it came to announcing its 2016 predecessor. Thankfully, they didn't disappoint, with one of the most innovative and exciting smartphone designs we've seen in ages. Why did the LG G5 get everyone talking at MWC this year? It's modular, letting users swap batteries, camera attachments and high-res audio gear. The G5 features a premium, all-metal body, removable 2,800mAh battery, and Quad HD screen. It's great to see something truly different in the smartphone market, and we hope it pays off. The G5 also came with 'friends', including a rolling robot, 360-degree camera, and VR headset... but it's best we don't mention the VR headset. The iPhone SE is a bit of a hero. It's small but packs a punch, with identical specs to the current range-topping iPhone 6S in a smaller 4-inch body, this is the perfect smartphone for people who want a smaller phone without compromising on power.